Shopping for Star Trek Bags? Make-up bag inspired by Uhura's uniform from Star Trek! 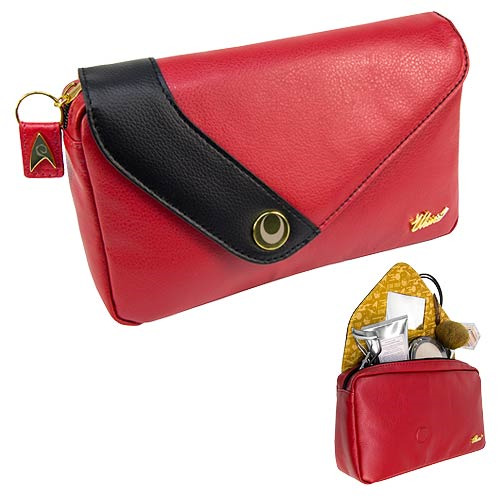 Features an Uhura signature badge and Delta zipper pull! Measures 9-inches long x 5-inches tall x 2 1/4-inches wide. Lt. Uhura from Star Trek was a natural beauty, but you might need a little help. The Star Trek Uhura Deluxe Make-Up Bag is a premium faux leather make-up bag with a custom molded, gold plated metal Delta zipper pull. There's even a molded metal Uhura signature badge in the lower right corner of the red bag. The asymmetrical flap inspired by Uhura's uniform with color block black applique and molded gold plated button completes the look! A hidden enclosure acts as secret storage. The Star Trek Uhura Deluxe Make-Up Bag measures 9-inches long x 5-inches tall x 2 1/4-inches wide. Ages 14 and up.